Part of the meeting in the store are beautiful and colorful boxes or pachechku with sea salt, we sometimes do not realize how much it is necessary and precious thing in our everyday life. How many-sided use of sea salt, and how strong therapeutic effect on the application. Background. Sea salt – salt is extracted from the sea, usually in a natural way (by evaporation of water under the influence of the Sun) or evaporation. The chemical composition of sea salt contains a large amount of minerals and trace elements. Among these are important for our organism, such as sodium chloride, potassium, sodium, magnesium, calcium, bromine, iodine. Sodium chloride – maintains the water balance, sodium and potassium involved in feeding cells are detoksiruyuschee action, promote purification of waste products from the cells. Calcium is involved in the formation of cell membranes, participates in the process of blood coagulation, is an important element for musculoskeletal. Magnesium is extremely important for the heart, improves metabolism. Bromine reduces irritability, calms the nervous system. Iodine stimulates the thyroid gland, reduces the level of cholesterol in the blood. And that’s not the entire list of “useful”. People extract salt from sea water for over 4000 years. 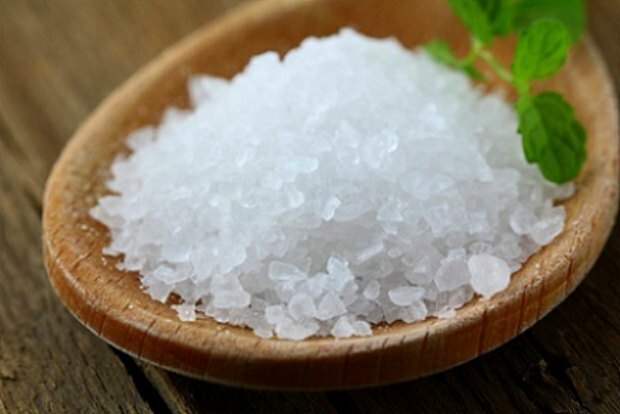 And the same time, sea salt is successfully applied in a number of diseases and for cosmetic purposes. What is the sea salt? sea ​​salt dirty white crystals, the size ranges from 2 to 5 mm. It has a specific smell, vaguely reminiscent of the smell of the sea algae. sea ​​salt is sold in what form? 1. Natural, without additives. 2. Natural enriched with essential oils, the compositions are chosen depending on the direction. 3. The salt body scrubs, they use sea salt fine grinding. In addition, sea salt is widely used for the preparation of cosmetics – creams, masks, lotions and tonics. How can I use sea salt in beauty and prophylactic purposes? Of course, the first thing that comes to mind is a bathtub. But a lot of variations, rubbing, compresses, rinses. Bath with sea salt has a relaxing, antiseptic, anti-inflammatory effect. The therapeutic baths with sea salt are shown to people with diseases of the cardiovascular system, the problems of the musculoskeletal system, skin diseases, chronic diseases of urology and gynecology, varicose veins. For cosmetic purposes bath with sea salt is used for weight loss in the period of anti-cellulite measures. Sea salt contributes to the removal from the body toxins and excess fluid. And the most important thing for relaxation. Taking a bath after a hard day do not forget to put it in a few handfuls of sea salt and your body will thank you. mud baths, salt, clay, where you will find sea salt. And the cosmetics section – there you will find scrubs Salt scrubs.